Capillary action (sometimes capillarity, capillary motion, or wicking) is the ability of a liquid to flow in narrow spaces without the assistance of, and in opposition to, external forces like gravity. 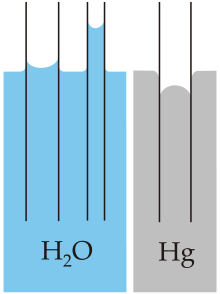 The effect can be seen in the drawing up of liquids between the hairs of a paint-brush, in a thin tube, in porous materials such as paper, in some non-porous materials such as liquefied carbon fiber, or in a cell. It occurs because of intermolecular forces between the liquid and surrounding solid surfaces. If the diameter of the tube is sufficiently small, then the combination of surface tension (which is caused by cohesion within the liquid) and adhesive forces between the liquid and container act to lift the liquid. In short, the capillary action is due to the pressure of cohesion and adhesion which cause the liquid to work against gravity.